I want to be brutally honest about myself. I constantly say I want to be a better disciple, a better husband, a better father, a better preacher, etc. but I don’t always do the things that are necessary to experience the growth I claim I want to see in my life. An athlete can say, “I want to run faster,” but unless he does something to improve his speed, it’s just talk. 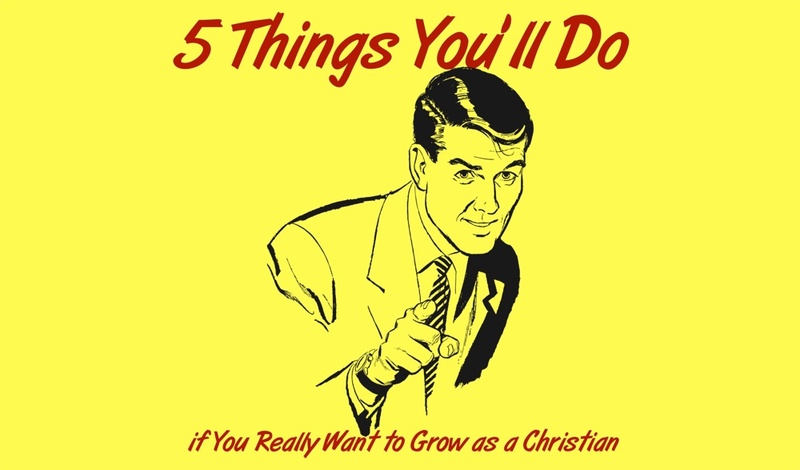 Here are some things you and I need to do if we really want to grow as Christians. 1. If you want to grow, you’ll read. How much time do we waste watching television, scrolling through social media, or doing other unproductive things? Imagine if we spent some of that time reading something that would help us grow. We must read the Bible, of course, but we also need to read books written by men. We need to learn from the wisdom and knowledge of others. We also need to avoid reading only things that reinforce what we already know, understand, and believe. We will never learn if we only read things written by those who think just like us. Read. Read with an open mind. And read with an open Bible. Be like the Bereans, who “received the word with all eagerness, examining the Scriptures daily to see if these things were so” (Acts 17:11). 2. If you want to grow, you’ll accept – and learn from – correction. How will we ever grow if we do not listen to the correction, rebuke, or advice of our brothers and sisters in Christ? And if you’re like me, you’re a lot better at dishing out correction than you are at accepting it and learning from it. Solomon wrote, “A rebuke goes deeper into a man of understanding than a hundred blows into a fool” (Proverbs 17:10). 3. If you want to grow, you’ll confess your sins. I am horrible at confessing my sins to my brethren. I want to be liked, and I’m afraid someone will think less of me if I reveal my struggles. But the truth is, I always think more highly of someone when he confesses his struggles. Confession is not a sign of weakness, but a sign of courage and strength. Find a close brother or sister in Christ, tell them the things with which you’re struggling, and ask them to pray for you and with you. Let them know you’d like for them to hold you accountable, but don’t use them as a crutch. If they fail to check up on you and you sin, don’t blame them. Go to them again, confess, and ask them to pray. James wrote, “Confess your sins to one another and pray for one another, that you may be healed” (James 5:16). 4. If you want to grow, you’ll ask advice from wiser Christians. The church is an intergenerational community, teeming with wisdom. In nearly every congregation, there are Christians who have raised faithful children, been happily married for decades, successfully run businesses with Christian integrity, and done almost everything you hope to do in your lifetime. Yet many of us leave that wisdom untapped because we are too proud to ask for advice. You could buy someone’s lunch and “pick their brain.” You could write up a few questions on a piece of paper and say, “If it isn’t too much trouble, could I get your thoughts on these questions when you have a chance?” You could even ask someone to mentor you. Most Christians would be flattered that you would ask for their thoughts and advice. Some, out of humility, may try to turn you down, but those are just the kind of people you want advising you! 5. If you want to grow, you won’t put too much emphasis on your experiences. In our culture, I believe we put way too much stock in our own experiences. Experiences, that are not tempered with the unbiased truth of Scripture, have a tendency to cloud our judgement and our perception of reality. I have seen people make changes in their lives not because they have learned or grown, but because a certain experience has reshaped their thinking. For instance, we’ve all known someone who used to take a biblical stance on an issue like homosexuality, until one of their children chose a homosexual lifestyle. Then, all of a sudden, they changed their stance on the issue. This change was not based on a clearer understanding of Scripture, but upon an emotional reaction to an event. They chalk their change up to “growth” and believe themselves to be more enlightened; but those of us on the outside can see the change for what it really is. Scripture – not our experiences – should shape our understanding and our behavior (Romans 12:2; 2 Timothy 3:16-17). If we want to move in the right direction, we won’t give our experiences any more weight than they deserve. Do we really want to grow? Remember, if we want to grow and be better tomorrow than we were today, we are going to have to be intentional about doing the things that will help us grow. I know I have a long way to go and I’m tired of just talking about it. I’m ready to go to work. How about you?